I've been thinking about Barbie since m. heart posted a gallery of shots of her collection. Her photos are much more artful than the Boston Globe gallery, but their history of her metamorphosis over the years was interesting. 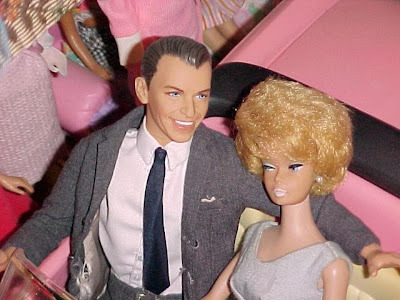 I must confess it reminded me of how much I loved my Barbie dolls. I know all the arguments about how awful a role model she was, but I don't recall role playing with her so much. I did however spend many happy hours making clothes for her when I was a kid. I knitted little sweaters and skirts and hand sewed elegant little gowns. I had three dolls. The first one was the classic pony tail girl with that odd face. And the second was the popular bubble cut Barbie in the photo. Both had blonde hair. My third one was not actually Barbie, although she fit into the same clothes. I always thought of her as another Barbie. I spent a while today trying to find out who she was and as it turns out her name was Tressy, the doll with the hair that grows and grows. I got her just I was growing out of the doll stage but I was into styling her hair. As I recall eventually I gave her so many haircuts, she had a permanent bob. She was blonde too.